Born 3 April 1964, Nigel Farage is Aries, having the Ascendant in Virgo and the Moon in Sagittarius. In September 2006, he became the UKIP Leader and led the party through the 2009 European Parliament Election, when it won the second highest share of the popular vote. In 2016, Farage was a prominent supporter of the UK leaving the EU in the referendum. SUN, MARS AND JUPITER IN ARIES: The first sign of the zodiac, the fiery Aries is bold and fearless, ambitious, positive and passionate, but also impulsive, confrontational, arrogant and stubborn. The Sun represents the conscious ego, personal power, pride and authority, while Mars is associated with confidence, energy, strength, ambition and impulsiveness and Jupiter is associated with the principles of growth, expansion, and good fortune. 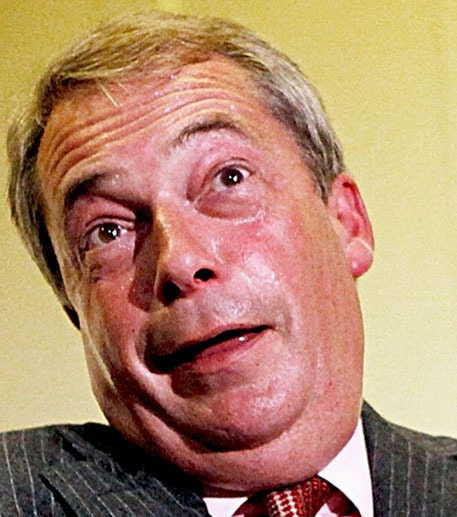 With Sun, Mars and Jupiter in the same zodiac sign, Nigel Farage has many qualities and defects of this zodiac sign. Most of Sagittarius Moon people love travel and enjoy visiting foreign places. Some of them even seek work and situations that allow them to contact with foreign places and cultures. Since 1999, Nigel Farage has been a Member of the European Parliament for South East England. His second wife, Kirsten Mehr, is German, and they have two children, Victoria (born 2000) and Isabelle (born 2005) – Nigel Farage has also the 4th house, the house of home and family, in Sagittarius. Lilith in Sagittarius has a lot of problems with foreigners and can even become xenophobe. It not so surprising that an anti-migrant poster unveiled by Nigel Farage has been reported recently to the police with a complaint that it incites racial hatred and breaches UK race laws. He also is the man who said that „whether it is the impact on local schools and hospitals, whether it is the fact in many parts of England you don’t hear English spoken any more. This is not the kind of community we want to leave to our children and grandchildren“. The Moon and the fourth house in Sagittarius tell Nigel Farage to love foreigners. On the other side, the Black Moon in Sagittarius tells him that the foreigners are dangerous. 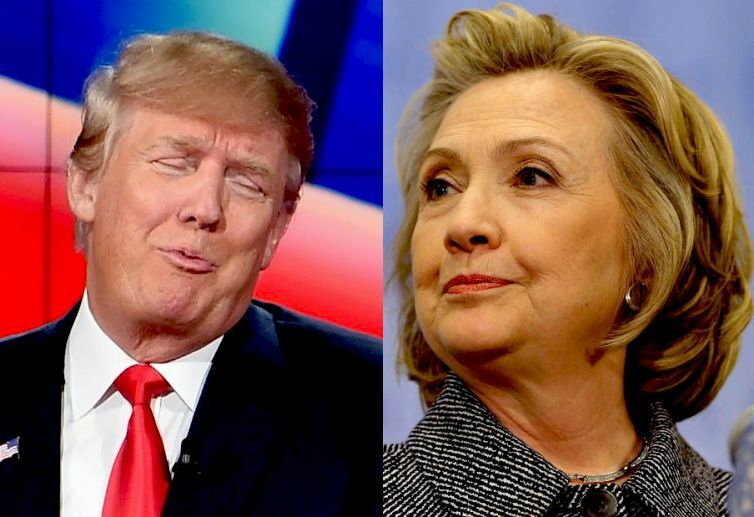 How Nigel Farage did manage these opposite influences? Well, he seems to have developed a philosophy that divides foreigners in good ones and bad ones. Speaking on the James O’Brien show, in 2014, Farage said: „I was asked a question if a group of Romanian men moved in next to you, would you be concerned. If you lived in London I think you would be“. When O’Brien asked him what would be the difference between Romanians moving next door and Germans, citing Nigel Farage’s own German wife and children, Farage responded: „You know the difference“. So, for him, there are good foreigners and bad foreigners. There is no need to remember what political ideologies divided people in a similar way. Pluto on the Rising Sun brings a tendency to dominate and manipulate others. These features are essential in politics and Nigel Farage makes use of them at any occasion. This is one of the recent moments when Farage admits that he lied. Next morning after Brexit, he publically admitted that his campaign about the millions that National Health Service could receive it was all a lie and that the NHS would almost certainly not get a penny more as a result of the Leave vote. Pluto conjunct Ascendant also indicates a survivor, a man who regains stability when his life is knocked off track. Alexander the Great had this aspect on his birth chart, but also Muammar al-Gaddafi and the Roman emperor Nero. Midheaven in Gemini indicates an adaptable and easy going person. He has a good understanding of the fact that everything changes. Gemini Midheaven prefers careers that use words, like public relations, journalism, teaching or politics. So, becoming politician was a good choice, for Farage. But his Midheaven squares three planets: Saturn, Uranus retrograde and Pluto retrograde. Uranus and Pluto are trans-personal planets and represents generational trends. 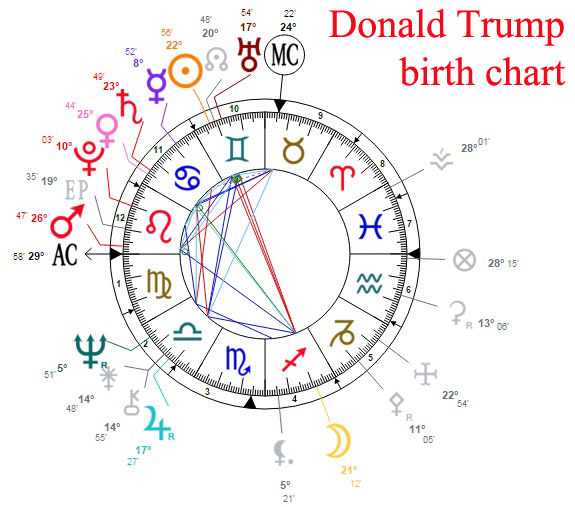 So, these stressful planetary aspects indicate that Farage’s career and public image doesn’t match with the present generation’s beliefs and expectations. 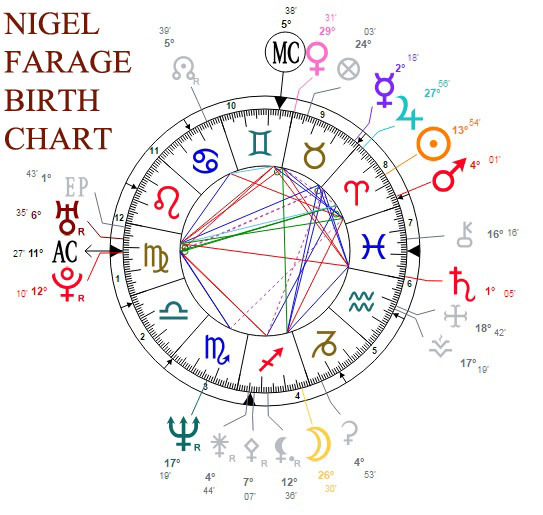 Share the post "Nigel Farage’s Birth Chart: the Ambitious Aries, the Good and the Bad Foreigners"